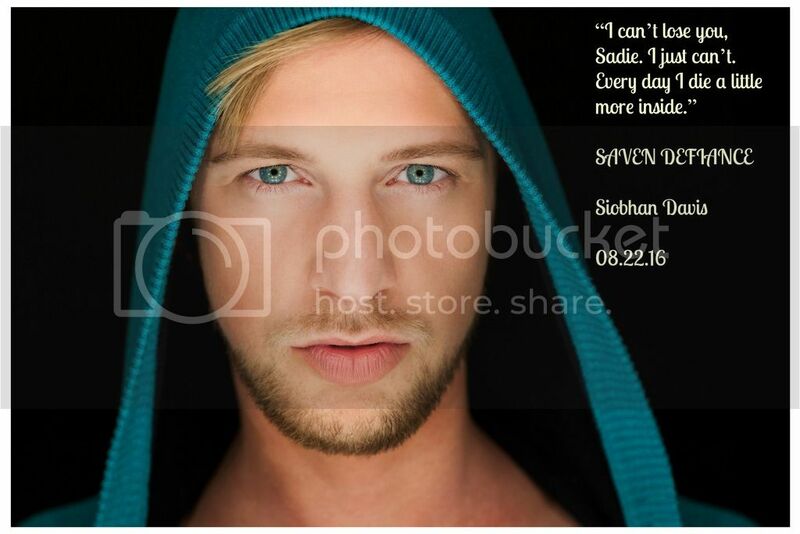 Happy Release Day Siobhan Davis! 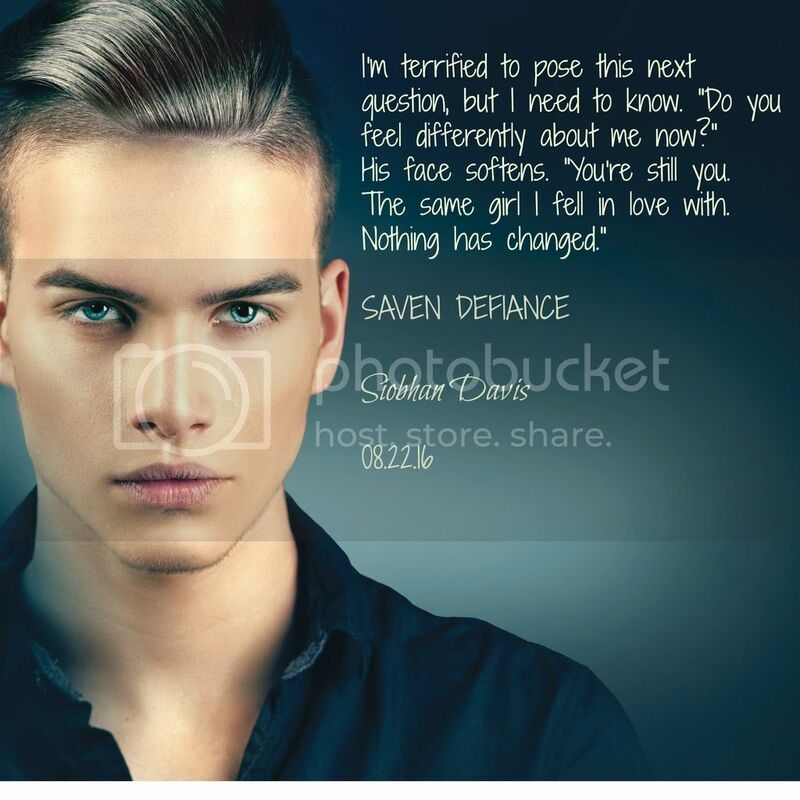 I am so excited to share with you all the latest book in the Saven series Saven: Defiance! This installment to the series is chocked full to the brim with answers, surprises, and DRAMA. If you’re a fan of the series, you don’t want to miss it! As the heirs unite in a bid to restore peace to the galaxy, powerful enemies, determined to exact retribution,surround them on all sides. When hidden agendas and shocking revelations come to light, the fallout is massive. Seriously….one word for this book….DRAMA!!! 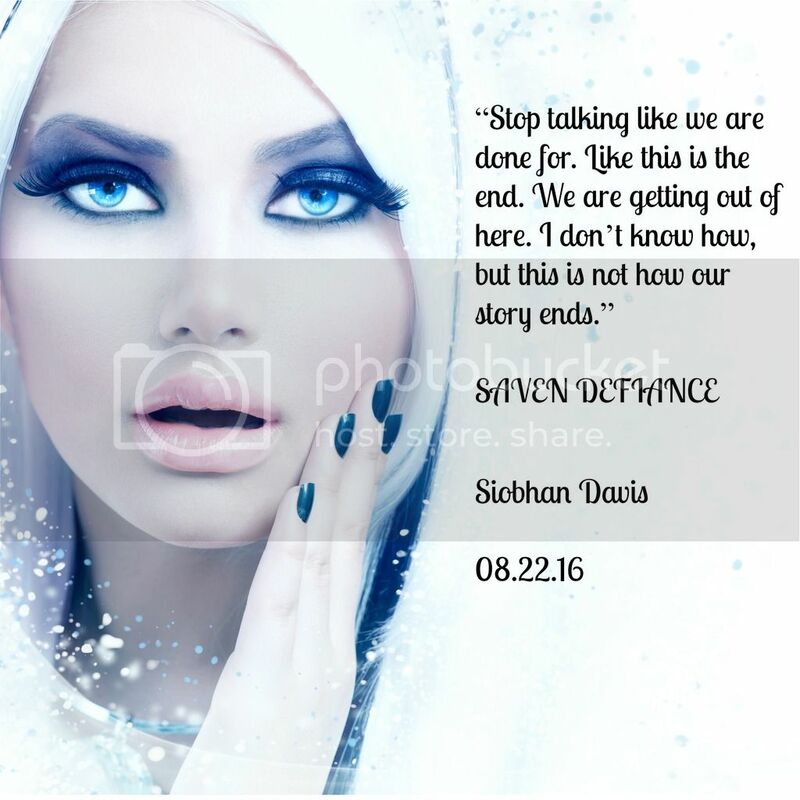 Saven: Defiance by Siobhan Davis is a suspenseful, emotional rollercoaster that takes the series to an entirely new level. I’m honestly having a hard time coming up with words to describe my emotions while reading this book. It’s was full of highs and lows and everything in between. I think I felt the full gamut of emotions: love, rage, hate, jealousy, happiness, and joy. And that ending…. Sadie, love, I have not been your fan. In fact, your drama has annoyed me to no end. However, the maturity you show in this book as you handle the drama that is your life deserves a standing ovation. Seriously, how you dealt with the revelations, the scandal, the horrors that are done…..bravo!!! You are a girl others can look to. You are showing me and the other doubters that you can reign as queen by Logan’s side. Yay!!! To be #TeamLogan or #TeamAx? That is a good question! On one hand, Logan and Sadie share this amazing bond, the Eterno connection. It’s cool, they can talk in each other’s head, they are the other’s soul mate. On the other hand, there’s Axton who had Sadie first. He’s her….I don’t know. She loves him, but he isn’t enough. My heart aches for Ax, he’s SO good to Sadie and she shuts him down. But Logan’s good to her too, even if he can be a little over-possessive at times, in my opinion. And then all the revelations about the two guys, their past, their connection to Sadie, their secrets…it’s too much! And then the climax of the book, the plot that revolves around taking Saven from Dante, saving Earth from the Saven and Amaretti….dear Lord, Siobhan Davis what are you trying to do to your readers?! The action, the suspense, the vivid, horrific details of actions taken by other characters that Sadie bears witness to…..too much!!!! It was amazing! The writing and the details, the foreshadowing, the character development were brilliant. 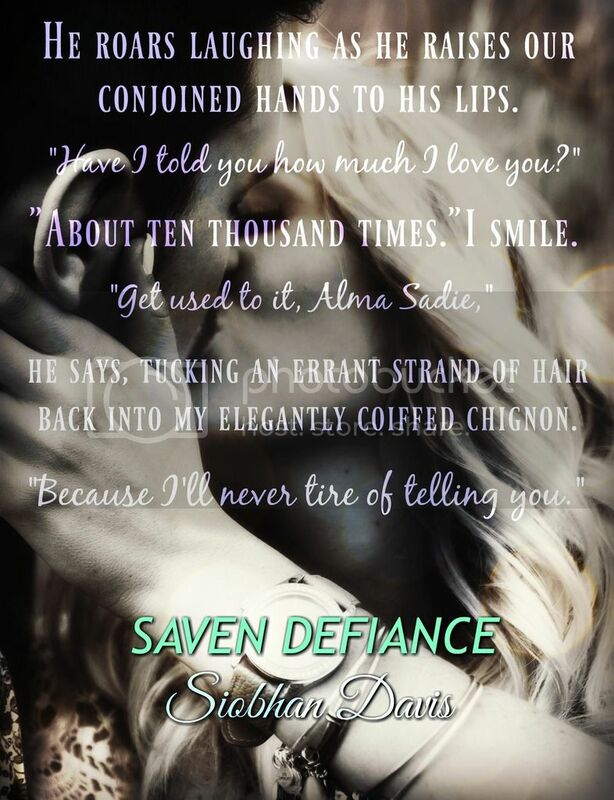 I’ve had the honor of reading all of Siobhan Davis‘s books thus far, and if I may so, Saven: Defiance is her best! Overall, I’m in love with this book! Sadie has finally come into her own as a strong leader and female heroine. I loved her changes and growth! The relationship with Logan and her strained friendship with Ax add a little drama….okay a LOT of drama but it fits so well with the plot that I couldn’t tear my eyes from the pages. If you’ve liked the series so far, you don’t want to miss this book. There are so many answers to so many questions that have been building through the series. It’s coming to an end and I’m excited and sad to see what will happen to Sadie and her friends. If you’re a fan of sci-fi, I highly recommend you check out the series, starting with book one! Fair warning my friends, the ending is not pretty. Be prepared for tears and lots of em!!! Now, don’t mind me. I’ll be the one wallowing while we wait for the next book! 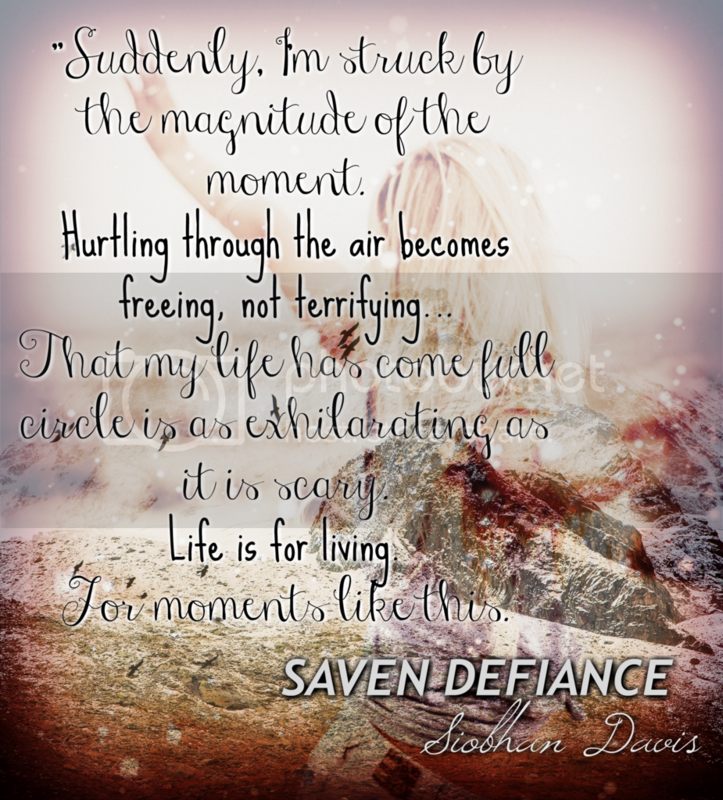 Siobhan Davis is giveaway a $5 gift card as a part of Saven: Defiance‘s release!